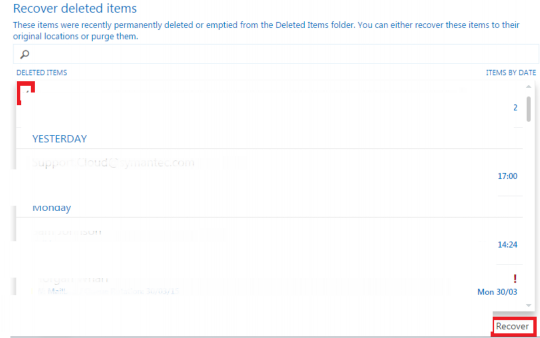 When you delete an item it moves into the deleted items folder within your mailbox. 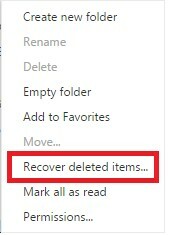 If you have deleted an email from your Deleted Items, they will go the Recover Deleted Items, it is also possible for items to go straight into the Recover Deleted Items. If an Item has been deleted for longer than 90 days, it cannot be recovered as it is purged from the mailbox. Log into the Outlook Web App at https://outlook.hs20.net with your Email Address and Password. Select the items you wish to restore and click Recover. These items will be restored to the location they were originally deleted from.